The pieta, pieta, michelangelo's pieta, the pieta by michelangelo, michelangelo. St. Peter�s Basilica (San Pietro), Vatican, 1499 A.D. 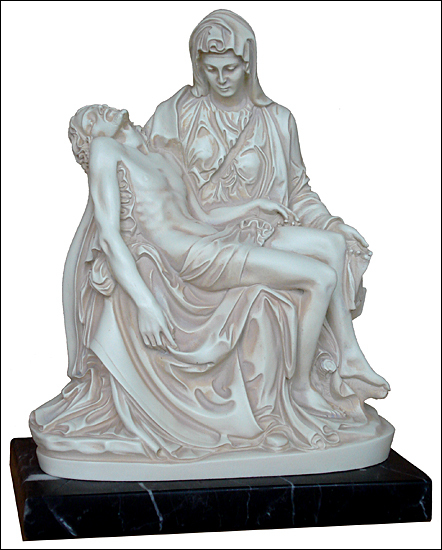 This famous marble work of art depicts the body of Jesus in the arms of his mother Mary after the Crucifixion. It takes to the extreme the Renaissance ideal of classical harmony, beauty and restraint. In the Piet�, the twenty three year old Michelangelo presents us with an image of the Madonna with Christ's body never attempted before. Her face is youthful, yet beyond time; her head leans only slightly over the lifeless body of her son lying in her lap. The body of the dead Christ exhibits the very perfection of research in every muscle, vein, and nerve. No corpse could more completely resemble the dead than does this. There is a most exquisite expression in the countenance. The veins and pulses, moreover, are indicated with so much exactitude, that one cannot but marvel how the hand of the artist should in a short time have produced such a divine work. Michelangelo convinces us of the divine quality and the significance of these figures by means of earthly beauty, perfect by human standards and therefore divine. We are here face to face not only with pain as a condition of redemption, but rather with absolute beauty as one of its consequences. The figures are quite out of proportion, owing to the difficulty of depicting a fully-grown man cradled full-length in a woman's lap. The statue was commissioned by the French cardinal Jean de Billheres, who was a representative in Rome. The statue was made for the cardinal's funeral monument, but was moved to its current location in the 18th century.